"Digital product development is very different than it used to be"
DIGITRANS - "Digital product development is very different than it used to be"
Digitization presents enormous chances and challenges to all companies. One of them is the development of new digital products that needs to be consistently thought of today by the user. Especially small and medium-sized enterprises (SMEs) need support. DIGITRANS wants to provide this assistance with a two-stage process – divided into innovation and transformation process. 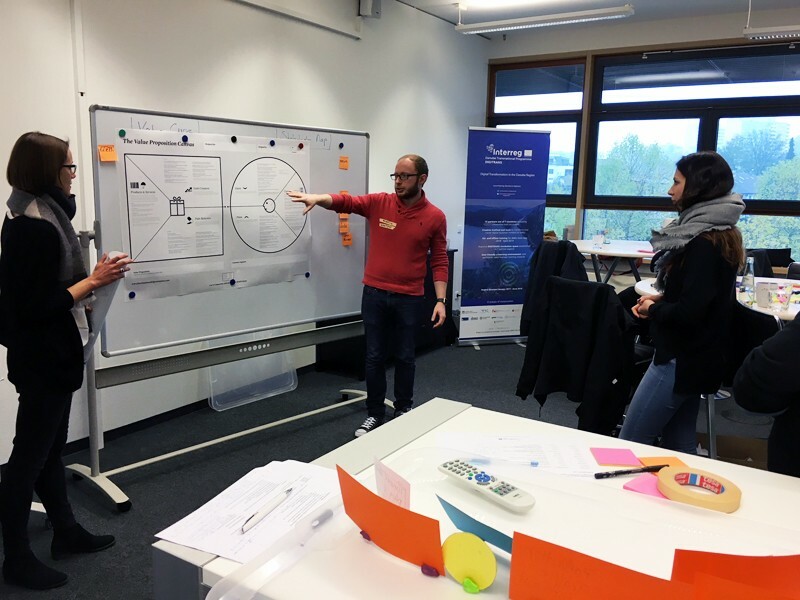 In November, the publishing house Verlag Herder from Freiburg (DE), with five participants, went through the so called business model workshop developed within the DIGITRANS method framework - together with four employees from MFG and Reutlingen University. Oliver Hübsch, Managing Director IT / Digital at Herder, speaks in an interview about the one-day event held at the Böblinger Herman Hollerith Center. "We could see what really fits well to us"
Interviewer: Mr. Hübsch, why was Herder the "guinea pig" for the project DIGITRANS? 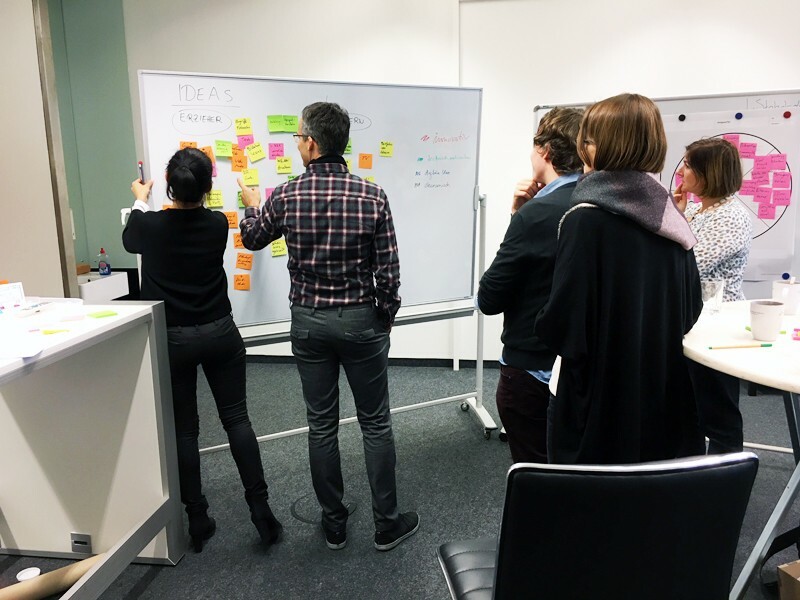 Mr. Hübsch: "The development of digital products is very different from what used to be done in the publishing industry - from putting teams together to formulating user stories to prototyping. Some of the methods used at DIGITRANS, such as agile development, are already in use. At DIGITRANS we were able to get to know other methods and see what really fits to us. After all, terms such as design thinking are omnipresent - but rarely actually implemented. As a publisher, we wanted to be able to judge whether it makes sense to take this over here. " Interviewer: Did you have something in mind before you went to the workshop? Mr. Hübsch: "We have chosen a product that we really want to realize. The idea for it already exists, but it has not yet appeared. It is a kindergarten software that digitizes processes for educators. In any case, we went to the workshop with an interdisciplinary team - ie editing, marketing, app management and an external consultant. In the incubator, we went through the entire process of product development from A to Z under laboratory conditions." Interviewer: And what did you learn? Mr. Hübsch: "First of all, there are so many methods in it that you better lay out the workshop for two days. It was exciting how many ideas we have collected. Unfortunately, there was no time to actually make a real prototype. In exchange we were able to go through our planned product, whether we had all use cases or still had blind spots. " Interviewer: Can you tell us a little bit about the process? Mr. Hübsch: "So far, we have no fixed method for prototyping at Herder, so we were very interested and open minded. In the workshop we first defined use cases for the different possible users. Then we identified how our software can solve which problems. And then we did a prototype - it can be a mock-up, something glued or a sketch on paper. With this we want to show the technology partner all essential points what the product should be able to do. We hope the idea will thus be conveyed better than it used to be with a specification book where you can misunderstand a lot. In addition, we can use the prototype very well to get direct feedback from our potential audiences and observe how they react or behave during the testing. " Interviewer: Is such a procedure not self-evident? Mr. Hübsch: "We as contracting entity must be able to convey what the product should be. It has been shown that technology partners or agencies have sometimes not understood when we used the previous methods. When we develop a prototype, it becomes clearer more quickly. And we can also test much more targeted, if the user accepts the product. For that it is important that the method is standardized." Interviewer: Can a company independently carry out a complete innovation process after the workshop? Mr. Hübsch: "If I imagine a small or medium-sized enterprise that has never heard of these methods - they may find it hard to do so, and after the workshop, they'll need a consultant. At Herder, we've been working on innovation methods for four or five years, using Business Model Canvas, for example, in app development. There is no pressure to play through the methods of the workshop one-to-one in the same way in the company. At least we will pick out a few key aspects and continue to work with them. The method Business Model Canvas has been set for us at the latest since the workshop in digital product development."